By Alexis Leon Mathews Leon, A. Chitra & J. Suganthi,Vijay Nicole Imprints Pvt. Ltd., 2009. 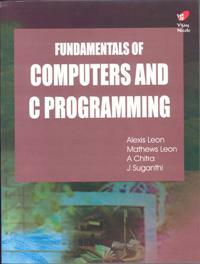 This book covers introduction to computers and C Programming. Designed as per the new Anna University syllabus for first semester, the book covers in toto the syllabi requirements of two papers--Fundamentals of Computers and Programming and Programming Lab.